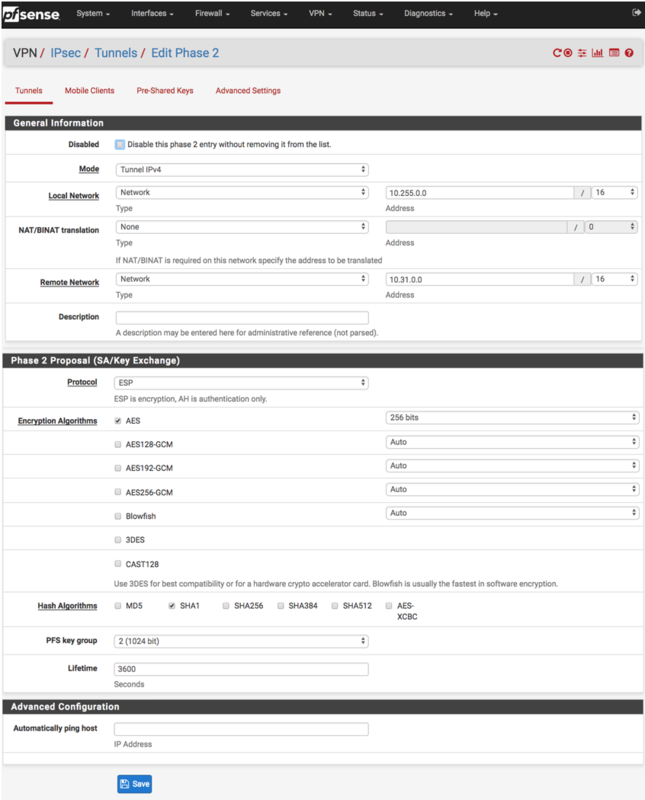 This document describes how to configure an IPsec tunnel between an Aviatrix Gateway and a pfSense firewall using Aviatrix Site2Cloud. Login to your Aviatrix Controller. Select the Site2Cloud navigation item on the left navigation bar. Click on + Add New near the top of the Site2Cloud tab. VPC ID / VNet Name Select the VPC where this tunnel will terminate in the cloud. Connection Type Unmapped unless there is an overlapping CIDR block. Connection Name Name this connection. This connection represents the connectivity to the edge device. Primary Cloud Gateway Select the Gateway where the tunnel will terminate in this VPC. Remote Gateway IP Address IP address of the pfSense device. Pre-shared Key Optional. Enter the pre-shared key for this connection. If nothing is entered one will be generated for you. Remote Subnet Enter the CIDR representing the network behind the edge device that this tunnel supports. Login to your pfSense dashboard. In the VPN menu, select IPsec . Remote Gateway Enter the public IP address of the Aviatrix gateway here. Pre-Shared Key Enter the PSK from the Site2Cloud tunnel creation step.